Italy - Let Us Be Saints! Much of Western civilization and culture stems from the Italian peninsula. Italy, including its islands Sardinia and Sicily, covers 116, 305 square miles and is slightly larger than the state of Arizona. This boot-shaped country is largely mountainous, with the Italian Alps on the northern border and the Apennines on the peninsula. Italy boasts a Mediterranean climate with winters being cold and rainy in the north and mild in the south. Summers are moderate in the north and very hot in the south. Italy surrounds two independent nations: San Marino and the sovereign state of Vatican City. Italy's population is roughly 58.1 million and is not growing. In fact concern about Italy's birthrate, one of the lowest in Europe, is growing. 67% of Italians reside in urban areas. Rome is the capital and most populous city with over 2.5 million residents. Italian is the official language of Italy, with dialects differing from city to city. The second most common language is English for youth and French for older generations. Nearly all Italians are Roman Catholic, though many don't practice their faith and Mass attendance for locals is low. However the Catholic Church does significantly influence all of Italy, socially and politically. The Italian constitution guarantees freedom of religion. People in the industrialized north typically value reliability, punctuality, organization, and financial success. They have a low tolerance for crime and are not likely to waste their precious time. People in the south however are known for their warmth and friendliness. They are leisurely and take their time doing business. Family values are emphasized in the south. Italians take great pride in their appearance and often dress up for evening strolls or casual visits. Italy is, after all, one of the centers of the European fashion industry. Young people follow the latest trends and often wear expensive, brand-name clothing. It is more common to see people of all ages wearing casual shoes, such as sneakers, and jeans. The Italian Republic is divided into twenty regions, which are each divided into provinces. Italy's president, currently Goirgio Napolitano, is chosen by an electoral college and acts as head of state. The prime minister, currently Silvio Berlusconi, is head of government and is usually the head of the majority party. The Italian legislature consists in the 315-seat Senate and the 630-member Chamber of Deputies. Citizens may vote in senatorial elections at age 25 and at 18 for all other elections. Italy's economy is based on industry in the north and agriculture in the south. Italy is one of the world's largest wine producers and a major producer of cheese. Other important crops include wheat, potatoes, corn, rice, fruits, and olive oil. Italy is also a major producer of steel and iron. The tourism industry comprises about 2/3 of Italy's gross domestic product. Because Italy is one of the world's seven major industrialized countries, most Italians enjoy a high standard of living. However the economy has been at a standstill since 2002 when the euro replaced the lira as Italy's currency. School attendance in Italy is free and necessary for students between ages six and fourteen. Classes are held Monday through Saturday and most young people spend a great deal of time on homework and take their education seriously. 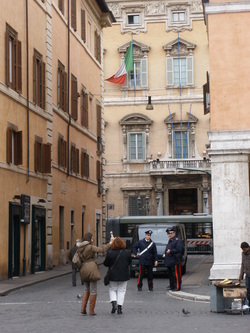 Italy has over 50 universities and institutions of higher education. Health care services are coordinated through government agencies. Individuals may choose their family doctor but the government pays for most services. .
Information from Culture Grams World Edition, 2009.